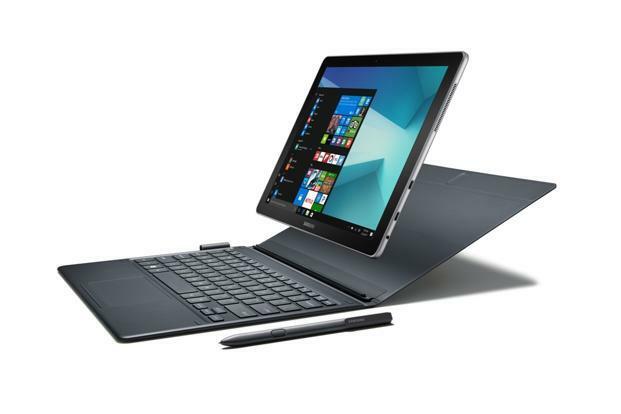 Powered by Windows 10 and a 7th Gen Intel® Core™ m3 Processor, the Samsung Galaxy Book is the ultimate PC replacement, featuring a revolutionary S Pen and keyboard for productivity on the go. Seamlessly connect your 2-in-1 to your Samsung Galaxy smartphone through Samsung Flow. The Galaxy Book gives you the full power of a laptop in a thin, lightweight design. Featuring Windows 10, the Samsung Galaxy Book is equipped with 4GB RAM, 128GB of storage, and a USB-C port for connecting all your devices, and the 7th Gen Intel® Core™ m3 Processor. Samsung Flow connects the Galaxy Book and your Samsung smartphone¹ with a touch. Share files wirelessly, even without Wi-Fi. Plus, receive and respond to notifications from third party² and native apps. Watch everything come to life on the stunning 10” Full HD Display, whether you’re browsing, streaming videos, or looking at photos.